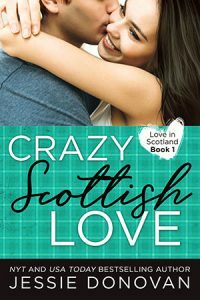 Tired of the online dating scene and her nagging mother, Donella Spencer braves her eccentric extended family and heads for a month-long visit to Scotland to stay with them. As long as she keeps to herself and avoids her family as much as possible, it should be easy to relax, right? What she doesn’t count on is running into Robbie Campbell, her childhood crush who tried so hard to ditch her nearly twenty years ago that it took a search and rescue team to save her. Not only that, she doesn’t expect to fall for Robbie’s daughter’s big, brown eyes and agree to hold a themed costume party for Donella’s 31st birthday. One that involves her relatives dressing in nineteenth century safari garb and dusty, old animal outfits. And none of that even begins to address her grandmother’s attempts to matchmake and marry off Donella within the month. However, as sparks fly with Robbie, she starts to think coming to Scotland was the right choice. If she can only get over her fear of children, she may finally have her happy ending in sight. Provided her relatives don’t drive her crazy first.